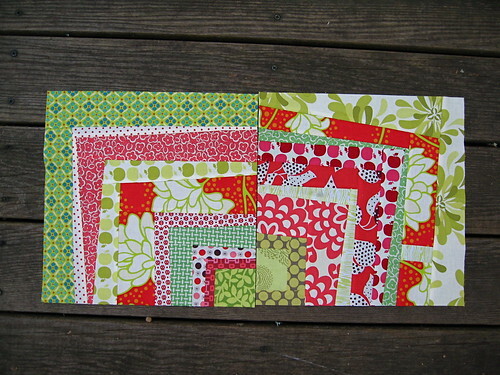 Fortunately for me, I was able to get back on track and whip through my July quilting bee blocks. They've all been mailed ... albeit a few days late. Want to see what I've been working on? I love the way her fabrics all play off of one another. I didn't get the strips to match up (I think I figured out why after the fact) ... but a quick glimpse through the Flickr pool revealed that most people's don't match up. I hope that's OK with Adina! 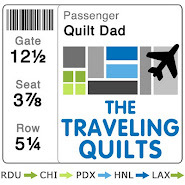 I still think it's going to be a rockin' quilt. Luckily, I was able to eke out a third block from Tina's remaining fabrics. (It helped that I had a few of the same prints in my stash!) 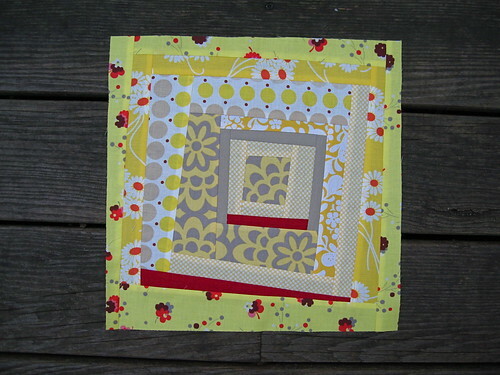 I was thrilled to see that, even though I was working under some constraints, I don't think the block suffered at all. In fact, I quite like how it turned out ... maybe even more so than the first two! I really can't wait to see Barb's quilt all put together. 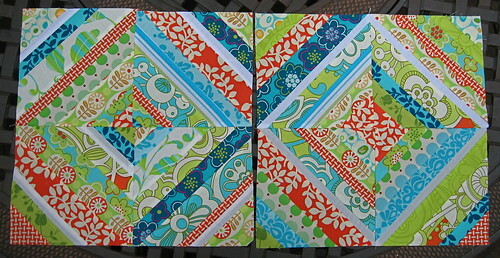 I was so jazzed about Barb's blocks that I asked for the same thing from my SewConnected 3 peeps. August is my month in that group, and I cut up and sent out all of the Good Folks fat quarters that I've been hoarding for the past few months. Darci asked us to use paper foundations for these blocks and, if you've been reading my blog, you know that I am paper-piecing-averse. I've always used muslin foundations when making string blocks, so taking that leap to paper was HUGE for me! I ripped out pages from my phone book to use because I read somewhere that they tear off pretty easily. I am happy to report that my first time using paper foundations was a success! I think I've been making much ado about nothing. 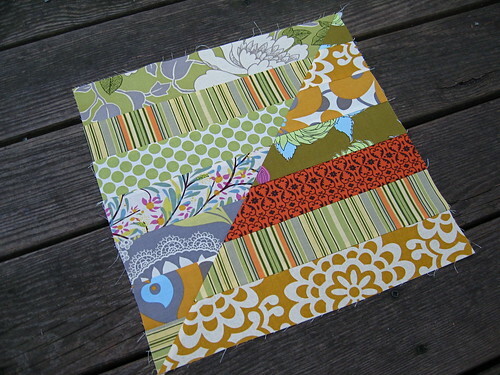 I'd be happy just to hang this block in my sewing space ... or anywhere else in my home, for that matter! I hope Emily likes it. I know I am going to be totally envious of her final quilt. You should really go take a quick look at the SewConnected pool and see the blocks that everyone has created for Jacquie so far ... 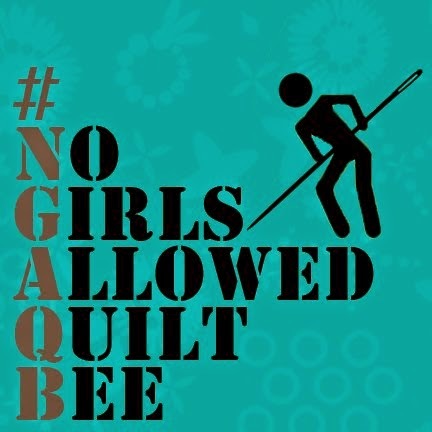 I think know her quilt is going to be amazing. I haven't started working on any August blocks yet, but I have been pretty productive the last couple of days. Besides working on a few super-secret projects, I've been on a bit of a bag bender ... 3 bags whipped up in the last few days (pics soon, I hope) ... and have also been dabbling in (gasp!) embroidery. Lots to share in the next couple of days, provided the rain stops and I can get some decent pictures. I really, really need to figure out how to take decent pictures inside of my house ... any tips for me?? Random snippet into my life: lately I've grown addicted to Kings of Leon Radio on Pandora and (surprisingly, because I've never been a coffee drinker) Starbucks Iced Caramel Macchiatos. That's about all that's new here. 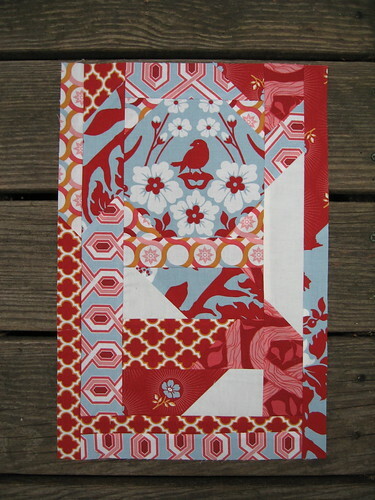 Oh, and I was at my local JoAnn's today and the woman cutting my fabric totally recognized me from my blog! Hi Grizelle! Isn't that funny? Those are all really nice blocks. So what if they're a bit late. Good things come to those who wait. All gorgeous blocks. I love each and every one of them. I agree, they are all wonderful! The top one looks really good with the stripes not lined up I think. Funny how mistakes can sometimes turn out to be a better idea isn't it? Hi, I love all your blocks especially the string ones, I've never tried that block before but would love to have a go. Oh my John....those are all spectacular, especially the last one! I love how when using the white fabric the seams show and add to the block. Thanks for all the inspiration and can't wait for 9/1! Great blocks, John!! . . . I'm a strong advocate for using muslin for foundation piecing (especially since you don't have to tear it out when you're done). That's funny - I was at Joann's too. I've been going there alot lately - with those 40% off coupons -it's hard not too. Phone book paper - I'm going to try that. I really like those wonky 1/4 cabin blocks, they looks so interesting and different! I need to venture out and try them. Still trying to figure out photographing inside as well. If it's been snowing out, I can manage a sort of decent photo near one of my windows. I've seen some people who actually have a staged light area for indoor photography. Amazing blocks - WOW!! I need to try those Wonky Log Cabin 1/4 - fun! Oh man! Had I known that you hated the paper I would have said to use whatever you wanted, it really wouldn't matter in the end. I really just wanted you all to have the same size blocks and liked that tutorial the best! I am glad it was not a total disaster! Thanks so much! P.S. so when you make a spiderweb block you use Muslin as the backing and then leave the Muslin on there???? These blocks looks so good! Love all your blocks and the designs that are picked. Love that bird block too! It would make the perfect mini. You are one busy dude! Keep it up! Loving all the blocks, they are fab! i especially love the first two! thanks john...i love my block! i was going to tell you which blocks are my favorites, but it would be so hard to pick! you do so great! and how cool that you were recognized at joann's. :) funny. Wow great job! I love the yellow and gray cabins you worked so hard on! Hi John, from a fellow NC resident (Triad). I love how you combine the colors on these pieces and everything else you are showing. 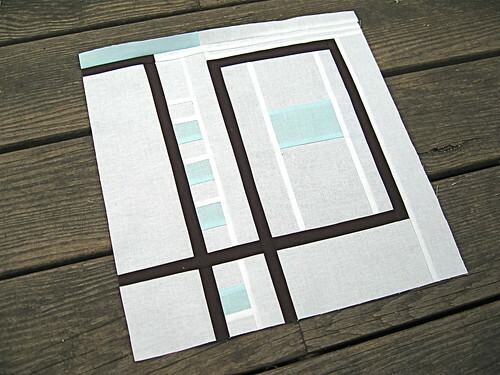 I loooove that modern white black pale aqua piece. So cool, so fresh. 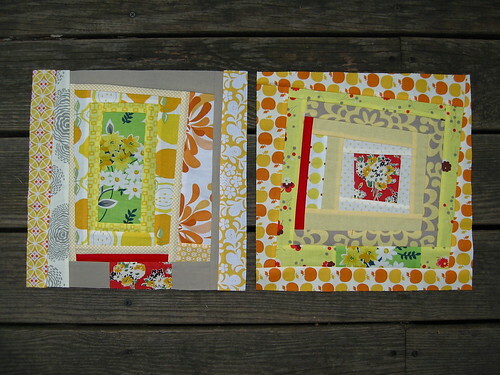 Beautiful blocks, and so cool that recognized you from your blog!!! Amazing! I'm a terrible quilter at best, but I love looking at all your intricate blocks! Dude! You were recognized at Joann's! That's so rad. What's next - papparazzi snapping photos from the woods around your house and hanging around Starbucks waiting for you to come in? You might have to hire a bodyguard.